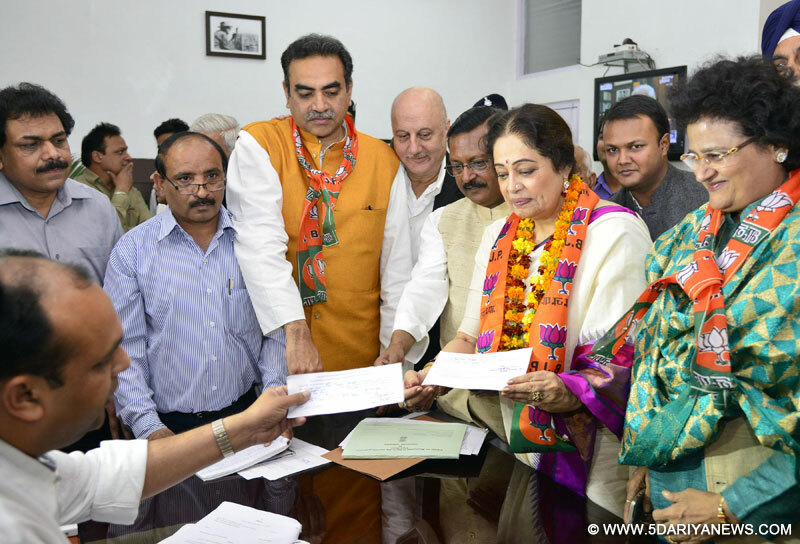 The Bharatiya Janata Party’s MP candidate Kirron Kher filed her nomination papers for the Chandigarh Lok Sabha seat, before the Returning Officer, in Chandigarh today. Kirron Kher was accompanied by National Secretary and Chandigarh In-charge of the party, Arti Mehra the State BJP, President, Sanjay Tandon, Former MP Satya Pal Jain and Anupam Kher.Earlier Kirron Kher had also addressed the party workers at party office, Kamlam, Sector 33. While expressing gratitude towards the party workers, Kirron Kher said, “I am thankful to the every party worker for the commendable support. I will work hard towards ensuring the victory from the Chandigarh seat. I would like to thank Sanjay Tandon for his support and he will be the local MP for you who will resolve all the issues. Now we all should carry out our campaigns aggressively for creating a mass connect”. Anpum Kher too expressed his gratitude towards the State President. Later on all party workers along with Kirron Kher moved towards the DC office for filing the nomination.